Opening reception friday may, 29th, 7-10pm! I will attend the opening and I am looking forward to meeting everyone that comes. 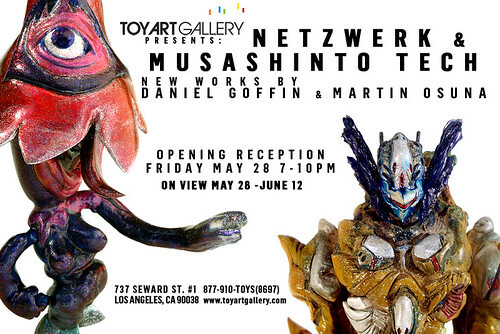 Toy Art Gallery is proud to present Netzwerk and Musashinto Tech – New Works by Daniel Goffin and Martín Osuna. The show will feature a variety of original figural works and multiple editions featuring their incredibly vivid and exceptionally crafted three-dimensional figures. This exhibition marks the U.S. solo debut for both Daniel Goffin (who hails from Kassel, Germany) and Martín Osuna (Pilar, Argentina), as well as being the inaugural show of our gallery. Daniel’s work focuses on the combination of man and technology, and the freedom and limitations such a fusion creates. His characters take design cues and citations from varied aspects of pop-culture: Haute-Couture fashion, cartoon character design of the 1930’s, Japanese animation and special effect TV-series. Daniel studied Manga at Kyoto Seika University, Japan and graduated from the School of Art and Design in Kassel, Germany with a degree in Visual Communication. About Musashinto Tech: In catastrophic desperate times, when the end is near, only the secret sacred clan of Musashinto has the power to restore order in the multidimensional scheme. The titans have awakened once again, and our last chance is to trust that the Mecha Samurai Shintoist Monks of the order will save us.